I can make anything a salad. I will literally put almost anything on lettuce. Sometimes, when it gets really hot outside, I start to miss fall. Well, today was one of those days! 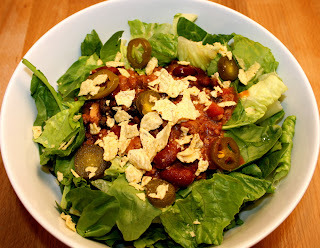 We had some chili in the freezer that I had made when it was much chillier outside and some lettuce in the fridge! Dinner was the perfect mix of fall and summer! Our favorite recipe for chili is one that I changed around a bit from CookingLight. It would be easy to make it vegetarian, but I use the turkey Italian sausage that it calls for. The only thing that I change is that I substitute soy crumbles for the ground beef (because why not make it healthier if you can). I also leave out the oil. I just don't feel like you need it. It definitely freezes well, so make plenty for leftovers! Good Friends, Good Food and Good Times!